Osage County road and bridge supervisor Glen Tyson, engineer Bob Chambers, and Osage County Commissioner Mike Pruitt inspect the support pillars, beams and girders under an old timber bridge on 229th Street. 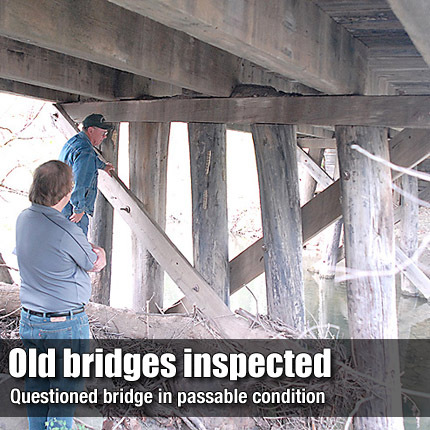 LYNDON—Two old bridges in eastern Osage County will likely not be replaced soon, after an inspection last week revealed the bridges were in better condition than some other bridges in the county. County commissioners briefly discussed the wooden bridges on 221st and 229th streets Monday, after a report from Osage County Commissioner Mike Pruitt about the inspection that was done April 4. “They’re not in danger of falling down right now,” Pruitt reported, echoing comments by the county’s engineer, Bob Chambers, who inspected the bridges last week. Last week Pruitt, Chambers and county road supervisor Glen Tyson visited the bridges, which are both located about a quarter of a mile from the county line on the former right of way of the railroad. The right of way is now controlled by Kanza Rail-Trails Conservancy. In recent months, commissioners have expressed concerns about the bridges’ condition and available funding sources to replace them. During a recent meeting with a KRTC representative, it was learned the conservancy would not participate in rebuilding the bridges, but would allow a 99-year lease for the county to maintain or replace the bridges. The bridges did not serve the former railroad and do not serve the proposed hiking and biking trail to be developed in the right of way. The bridges are used only by motorists who travel on 221st Street, a township road, and 229th Street, a county road. Commissioners have previously said the county did not maintain the bridges due to liability concerns.